Is he fit to serve? 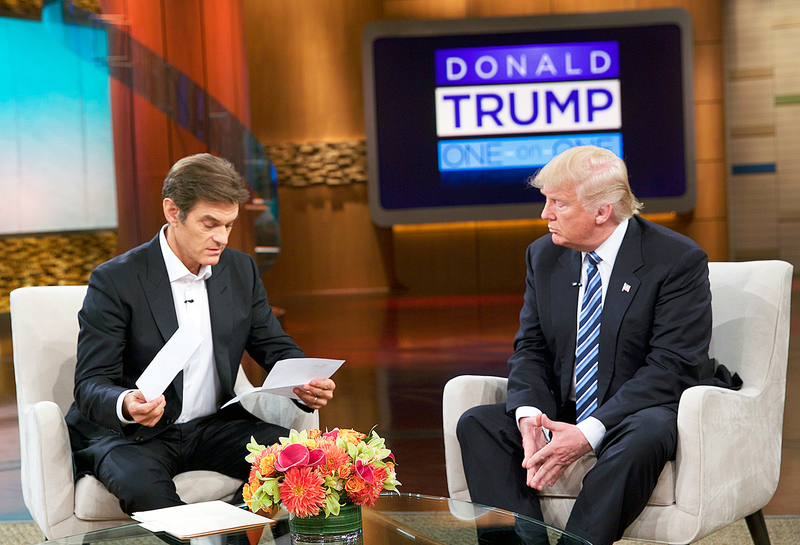 Donald Trump’s appearance on The Dr. Oz Show to discuss his health and medical records will air on Thursday, September 15, and a sneak peek of the interview shows Dr. Mehmet Oz grilling the Republican presidential nominee, 70, about his weight. In response, the former Apprentice star said that he wants to drop a few pounds. “I think I could lose a little weight,” Trump shared. “I’ve always been a little bit this way. … I’d like to lose weight. It’s tough because of the way I live, but the one thing I would like to do is to drop 15 to 20 pounds." PHOTOS: Celebrities' Political Affiliations — See Who's Voting Republican! Dr. Oz also took Trump through a full “review of systems,” including head or neck issues, hormone levels, heart problems, stomach or bladder issues and cancer history, as seen in the CNN clip. The billionaire businessman revealed he takes a statin to lower his cholesterol. The presidential hopeful decided to release his medical records in response to Hillary Clinton’s pneumonia diagnosis. The former secretary of state revealed she’d been sick after she abruptly left a 9/11 memorial service when she felt “overheated.” The following day, Clinton tweeted that she’s “feeling fine and getting better." Check your local listings to see when The Dr. Oz Show airs.